The first step to starting your own clothing line is to test the waters and do research. You don’t know whether or not you want to really start a clothing line until you go through the motions. However, I assume that if you are reading this you feel you have what it takes to make it in fashion. I also assume that you have a fashion vision and creativity that you are ready to unleash on the world. It is easy to stand outside of a window and wish you were inside. You will never know how miraculous it may feel until you decide to step through the door. You can’t be a window shopper. Seriously decide if fashion is a passion that you want to pursue. If it is, make the decision to invest in yourself. What that means is take a local fashion class if you want. Enroll in fashion school if you want. Even though the Fashion Mogul Package is our product and we may be a little bit biased but it is something you definitely want to consider adding to your arsenal. Even people who go to fashion schools still use the package so there really isn’t a substitute for it. Whether you have a lot of experience in the fashion industry or none at all but this business / design course is essential to giving yourself the edge in the fashion world. It will walk you step by step through creating your own fashion line. From what to do on day 1 to fully having everything running. The Official Guide will walk you through the entire process with clarity using a very simplified yet effective course of action. You will find that after completion of the book, your understanding of the fashion industry will be great expounded. You will no longer feel like a beginner. We have been helping aspiring fashion designers create their own fashion lines for over 10 years. We frequently hear feedback and updates from our clients. The most successful ones all have something in common. They were willing to invest in themselves and sought every opportunity to learn and grow. They believed in their vision and are actively working vigorously on their vision. It is wonderful when we hear back from our Startingaclothingline.com alumni. Because of the nature of secrecy and brand image issues many of our clients want to remain private. We totally understand this. Fashion is all about perception and people don’t like others knowing how they got started because they want to blend in with the elite. We have worked with the some big fashion labels and even designers from some of the major fashion labels that wanted to branch out on their own. Now it is your turn – see how we can help you here. We treat every client that same whether they are from a big clothing line or they are true beginners trying to get started in the business. We take great pride and humbleness in our position that so many people have trusted our website and products to help them. It is something we do not take lightly. We want you to succeed! Because your success is our success even if we can’t tell or share your success with others. We do not want anything holding you back. This is why we created this site in 2004 to help ordinary people overcome the challenges of starting their own clothing line especially when they don’t have a fashion background. As you may have seen on ABC’s Shark Tank, many times people get a deal with the sharks because the Sharks often say, “I am Investing in you because I believe in you.” They say this because they see the would-be entrepreneur is passionate about what they want to accomplish and have taken the steps to invest in their own dreams. I know I said this many times in this article but I want to drive this point home to you. If you aren’t willing to invest in yourself no one else will. When you believe in your dreams enough to actually take action the universe will conspire to help you. You can’t have faith without works. In close, remember that there is help available to you. 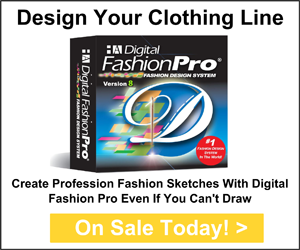 You can design clothing and create professional fashion sketches even if you can’t draw using a program like Digital Fashion Pro. You can get manufacturers to make your line even in small quantities. You can do all these things and more. Just believe in yourself and don’t be afraid to invest in yourself. When you ask who will be your first investor make sure you are looking in the mirror. Once you realize this one feat you have cracked The Secret to Raising Money to Start a Clothing Line or any business venture. Because once you make yourself looked polished and your business acumen is in place, people are more likely to want to invest in you and your dream. Article by Michael Harper, Co-Founder of StartMyLine.com, StartingAClothingLine.com, Co-Author of The Official Step by Step Guide to Starting a Clothing Line.